We provide a fantastic loyalty program for our returning friends. Simply click or scan the QR Code below to sign up and then we will see you soon to start earning points for Zi Bucks! Android: On your Android phone, please install WalletPasses to add your customer card. Windows: On your Windows phone, please install Pass Toolkit to add your customer card. 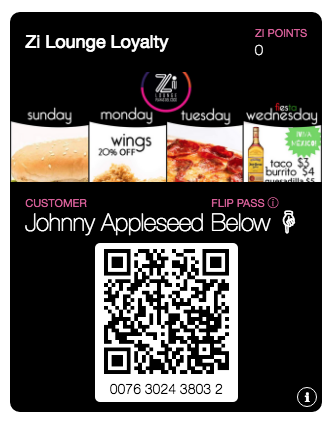 1.The Zi Lounge Loyalty Card Rewards Program is operated by Howling Monkey Marketing (www.elcocobeach.com) and its affiliates (we,us or our). By participating in our Rewards Program, you agree to these Terms and Conditions. 2.To join our Rewards Program, you must first complete the registration for our Loyalty Card and install in your smartphone. 3.You can earn and redeem points on eligible purchases immediately upon registration. 4.Once you have registered your Loyalty Card, you will always have it in your smartphone to view your points balance. 5.By presenting your Loyalty Card at the time of purchase, you will earn 1 point for each c1000 spent with a minimum of c10,000 purchase at Zi Lounge. 7.Before you can redeem points, you must first register your Loyalty Card – see paragraph 2 above. 8.You must present your Loyalty Card in order to redeem your points. 9.You cannot redeem or exchange your points for cash. You cannot sell or transfer your points to anyone. 10.If your Loyalty Card is lost or stolen, we feel bad for you because most likely your smartphone is gone too, You may request a new Loyalty Card by contacting info@elcocobeach.com. 12.We reserve the right to terminate your membership in our Rewards Program if you don't use your Loyalty Card to earn or redeem points for 12 consecutive months,or if we believe that you have engaged in fraudulent or unlawful activity or failed to comply with these Terms and Conditions. 14.We may discontinue our Rewards Program at any time in our sole discretion with no liability to you. If we do so, we'll publish a notice on our website and/or email you to let you know. 15.We may change the Rewards Program (including the number of points allocated to each purchasse and how points are earned and redeemed) and these Terms and Conditions at any time, or add new terms or conditions. If we do so, we'll publish an updated version on our website at www.zilounge.com . Your continued participation in our Rewards Program will constitute your acceptance of such changes. 16.These Terms and Conditions apply to our Rewards Program in Costa Rica, and are governed by the laws of Costa Rica. 17.We'd love to hear from you. If you have any questions about our Rewards Program or these Terms and Conditions, please contact us at info@elcocobeach.com.